All-rounder with weaknesses. Toshiba's 17.3-inch all-rounder is available for just under 1200 Euros (~$1346). The buyer gets a very well equipped computer with weaknesses: For example, the Satellite does not feature an IPS display. 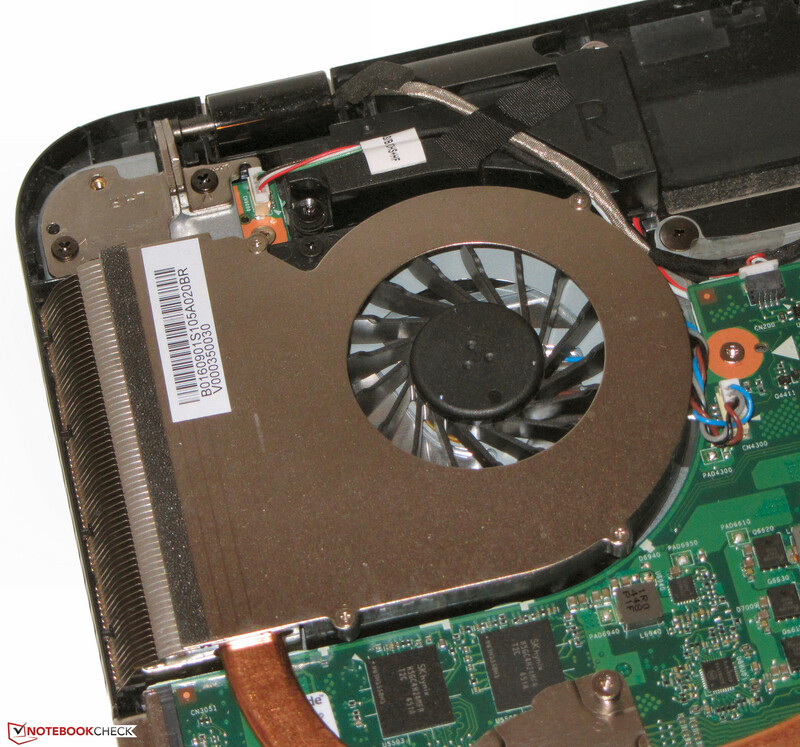 With the pre-production model of the Toshiba Satellite P70-A, we reviewed one of our first Haswell notebooks in summer 2013. With the Satellite P70-B-10T, we have a successor model before us now. The "B" indicates that something was changed in the new model. For example, the B model is slimmer, slightly more rounded and it lacks a maintenance hatch. However, the biggest changes took place inside: The second hard-drive slot of the A model disappeared and the processor no longer sits in a socket but is soldered. 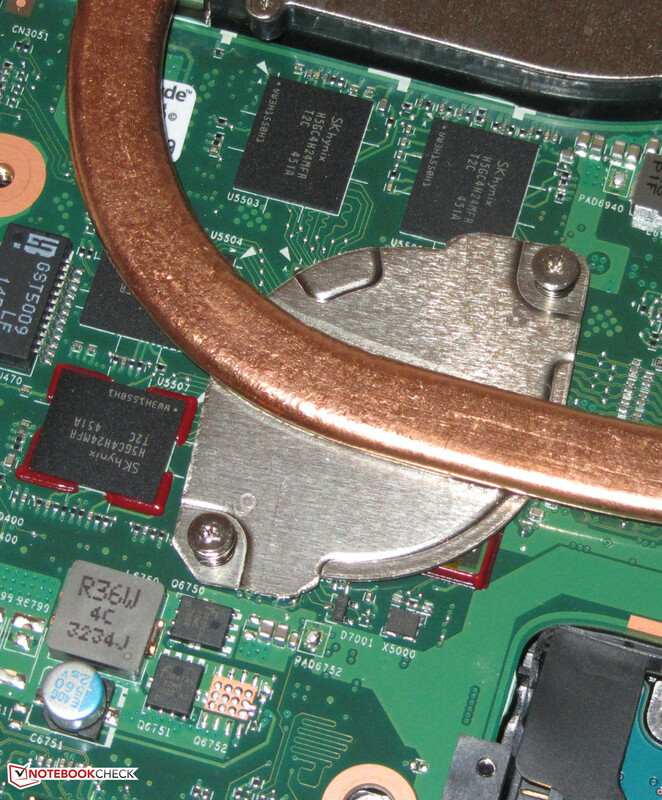 In addition, Toshiba replaced the GeForce GT 745M with a Radeon R9 M265X GPU. Our review reveals whether the Satellite profits from the changes. 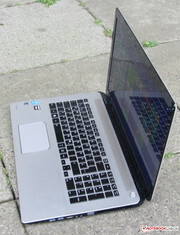 Computers like the Asus N751JK-T4144H, the HP Envy 17-k104ng, the Acer Aspire V 17 Nitro, and the Lenovo Y70 belong to the competitors of the Satellite. 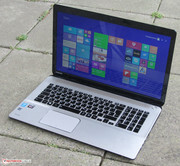 With a price of about 1200 Euros (~$1346), the Satellite does not belong to the cheapest notebooks. Accordingly, our expectations are high. 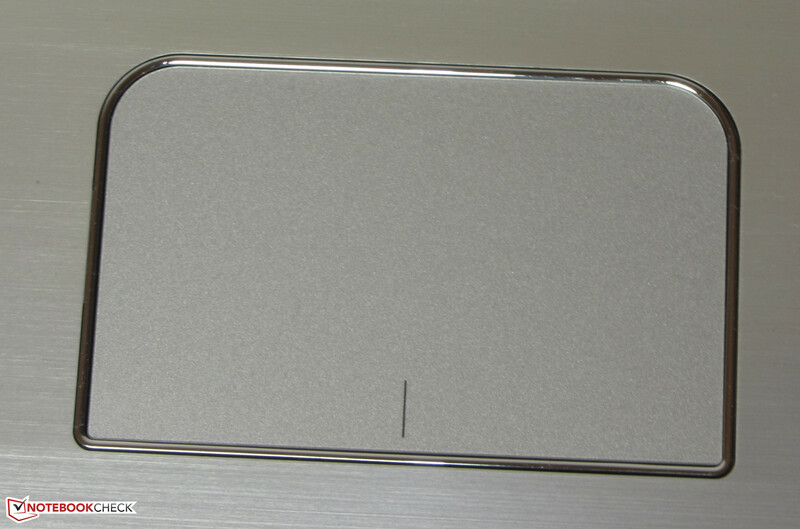 The lid and the palm rests are made from brushed aluminum. The underside of the base unit consists of matte, black plastic, while the display bezel is made from glossy black plastic. 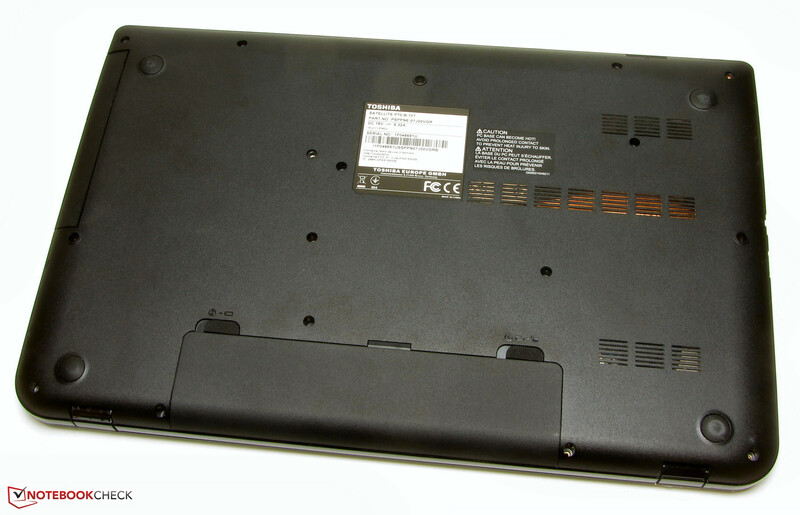 Competitors like the Asus N751JK-T4144H and the HP Envy 17-k104ng use the same blend of materials. In our opinion, the Asus notebook looks the most premium among the three devices in our comparison group. 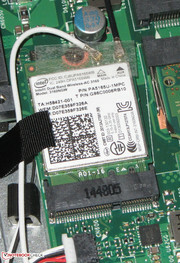 The Satellite lacks a maintenance hatch, but the case can be easily opened (see below) and the battery is removable. The stability of the base unit is generally good. Only the part above the optical drive can be slightly depressed if pressure is applied. 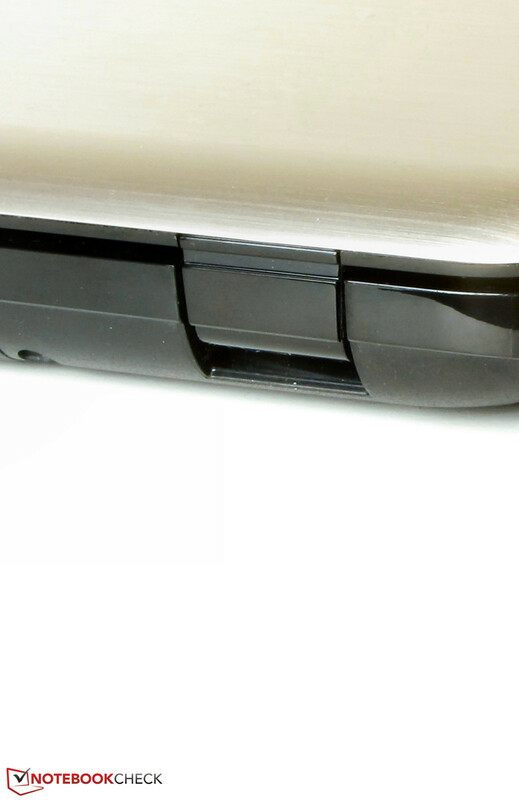 While the stiffness of the base unit is alright, the lid flexes too much for our liking. 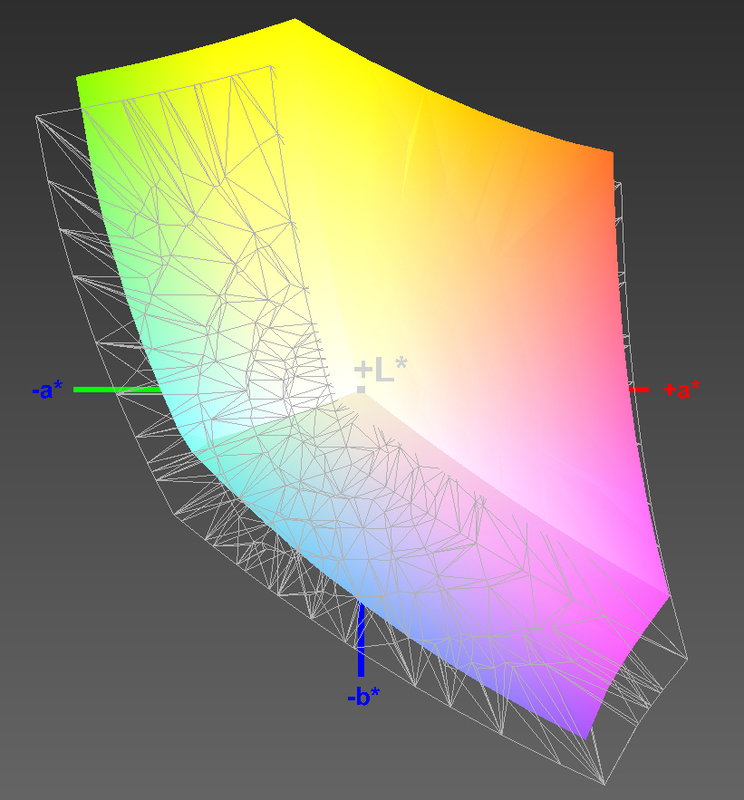 But, it is positive that pressure on the back of the display does not result in picture deviations. 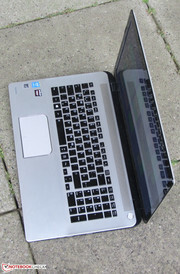 The build quality of the computer is not sufficient for 1200 Euros (~$1346): For example, the lid has sharp plastic edges and there are uneven gaps and material transitions at the display bezel. The hinges keep the lid firmly in position, but they wobble. It is possible to open the lid with one hand. The lid is made from aluminum. The Satellite brings the usual interfaces. Like the Asus N751JK-T4144H, it features four USB ports, but only two of them use the USB 3.0 standard, while this is true for all four USB ports of the Asus. 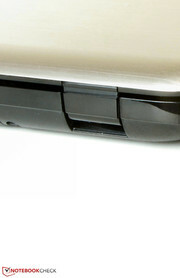 The Toshiba has most of the interfaces towards the front of the right side. So, the workspace right of the laptop gets easily crowded with cables. 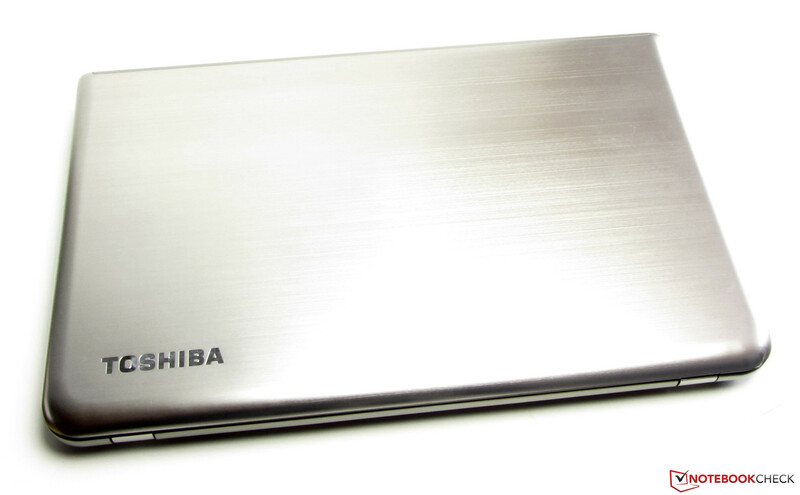 Toshiba equipped the Satellite with a WLAN module (Dual-Band Wireless-AC 3160) from Intel. Apart from the 802.11 a/b/g/n standards, it also supports the latest, very fast 802.11 ac standard. The WLAN connection between router and notebook worked flawlessly. The connection was stable directly beside the router and two floors below it. 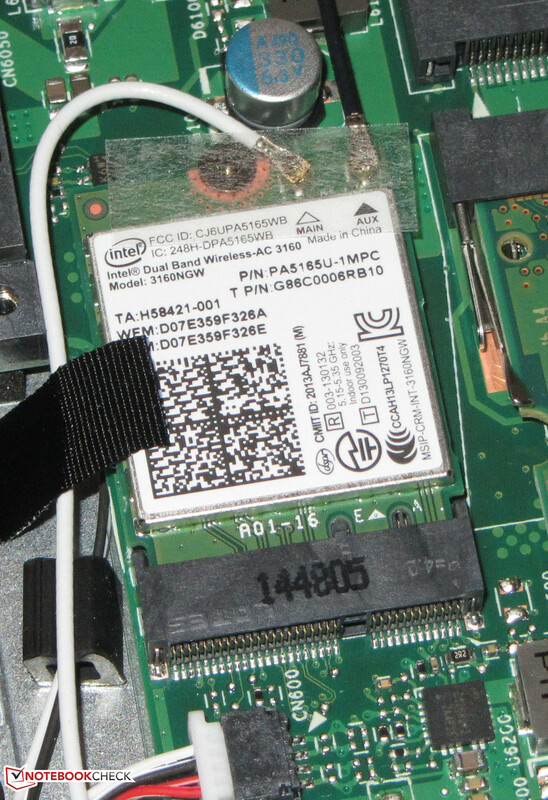 The built-in WLAN module also supports Bluetooth 4.0. The Gigabit Ethernet chip of the computer belongs to the Realtek RTL8168/8111 family. Most of the notebooks reviewed by us use such a chip. It worked flawlessly. The incorporated web cam produces quite noisy images with a resolution of up to 1280x720 pixels. Apart from a quick-start guide, warranty information is included. Windows 8.1 (64-bit) is used as operating system, but a recovery DVD is not included. 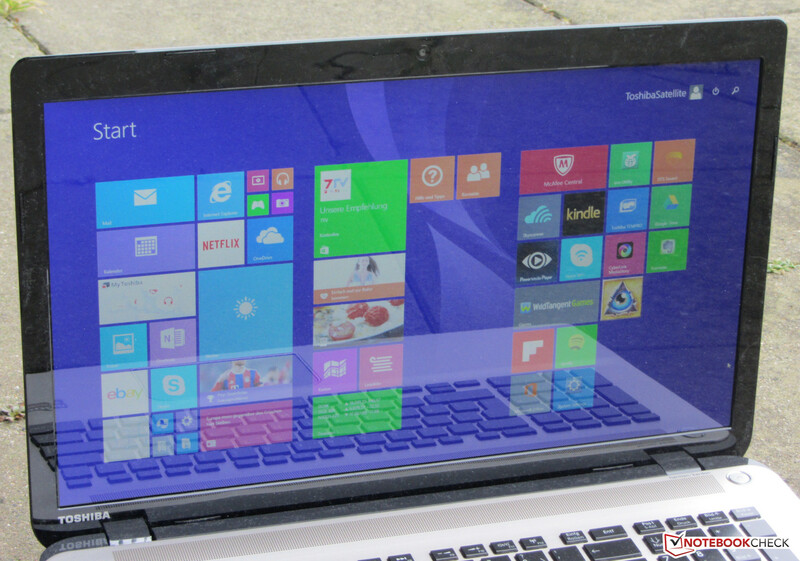 If you have no use for Windows 8.1, you can install Windows 7. 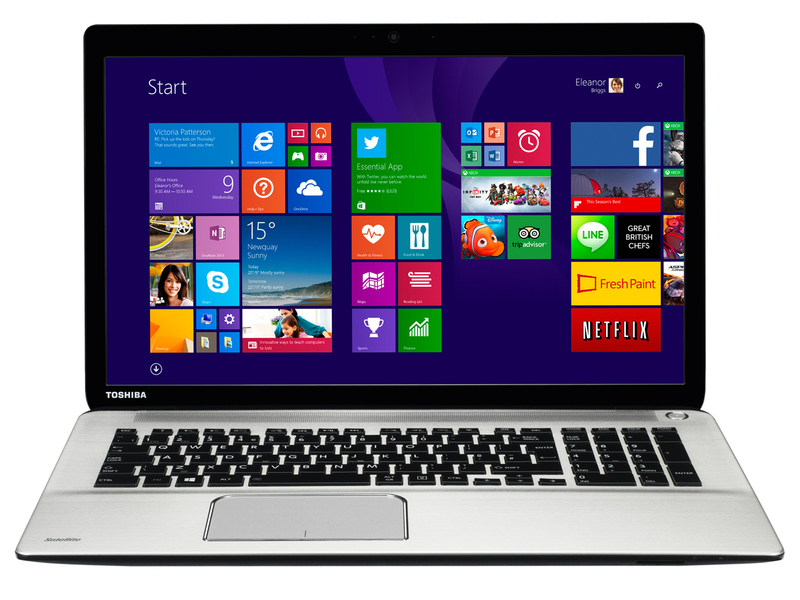 The necessary drivers can be downloaded from Toshiba's website. 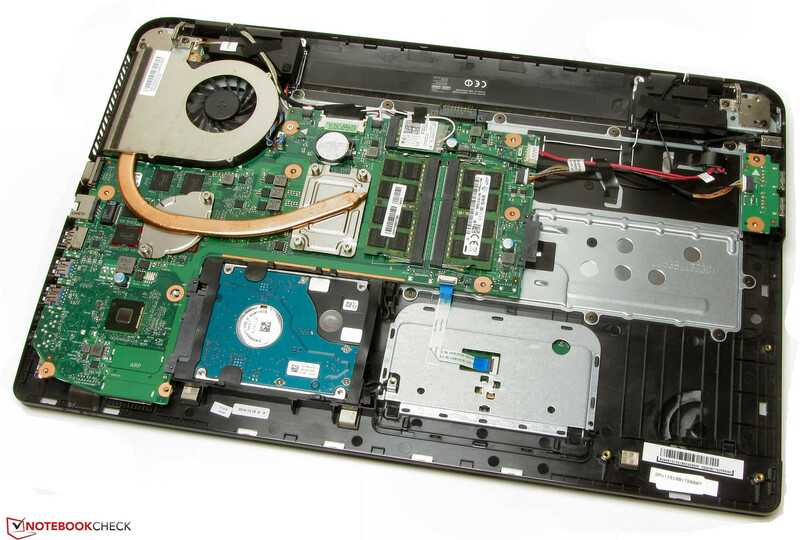 Although a maintenance hatch is missing, you can reach the hardware quite easily: Loosen the screw fixing the optical drive and remove it. Remove the rest of the screws on the underside of the notebook and the underside can be easily removed. 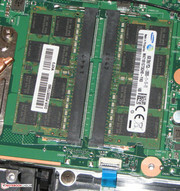 The Satellite features two RAM slots, which are both occupied by an 8 GB module. So, the maximum is reached. It is easy to replace the hard drive. It is not screwed, but a rubber frame keeps it in the holder. The Satellite comes with a two-year warranty just like the Asus N751JK-T4144H and the HP Envy 17-k104ng. The warranty can be extended. For example, a three-year warranty (including pick-up service) is priced at about 55 Euros (~$61). 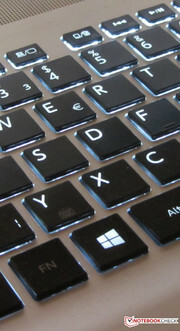 The Satellite uses a chiclet keyboard with backlight. The main keys have a size of about 15 x 15 mm. 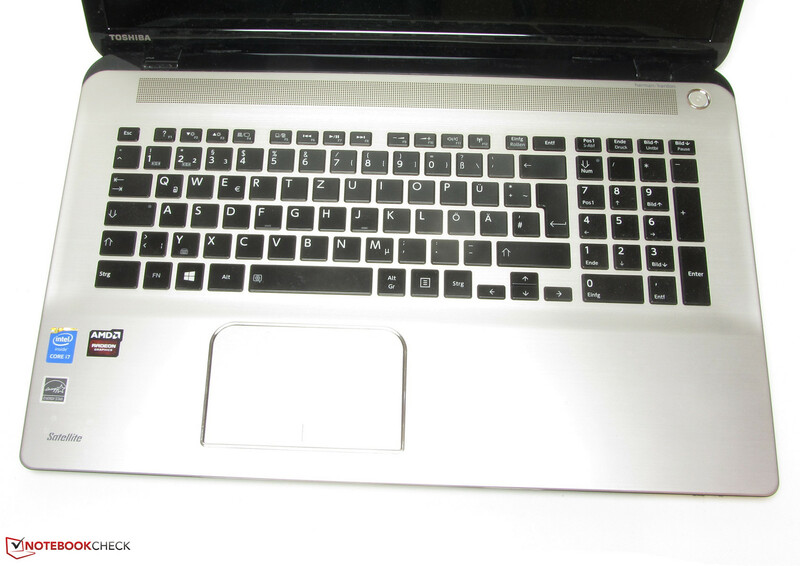 Overall, the keys have a smooth, flat surface and a medium travel. We liked the clear pressure point and the convenient resistance. The keyboard is even good for prolific writers. 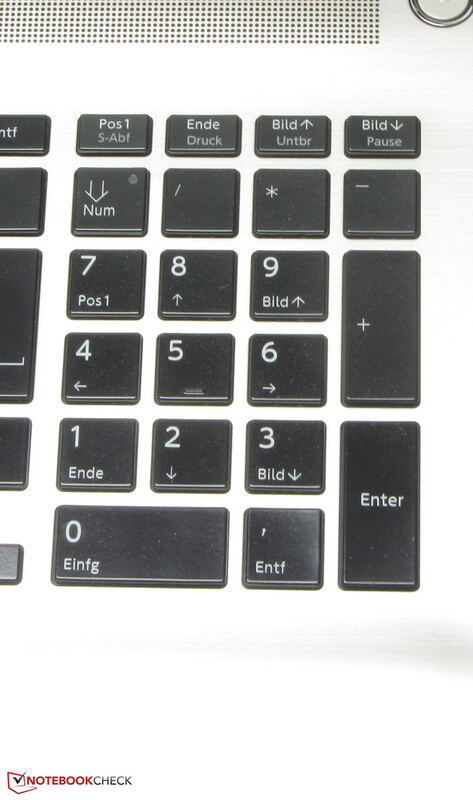 The light can be switched on and off with a function key. The mouse replacement is a multi-touch capable ClickPad (a touchpad without separate mouse buttons) with a size of 10.7 x 6.7 cm. Fingers glide easily over its smooth surface. Each multi-touch gesture can be enabled and disabled in the settings. Not all gestures are enabled by default. The travel of the ClickPad is short and the pressure point is crisp and audible. 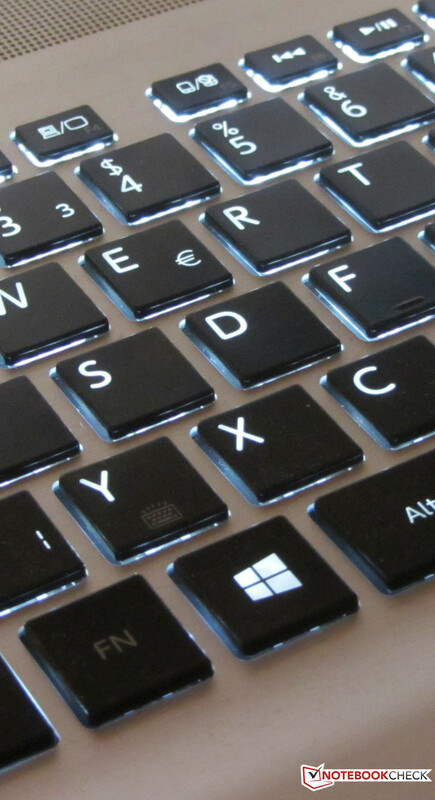 The keyboard has a backlight. The Satellite features a 17.3-inch display with a native resolution of 1920x1080 pixels. Unfortunately, the surface is glossy. The brightness of 303.4 cd/m² is good and on par with the Asus N751JK-T4144H's display (306 cd/m²). 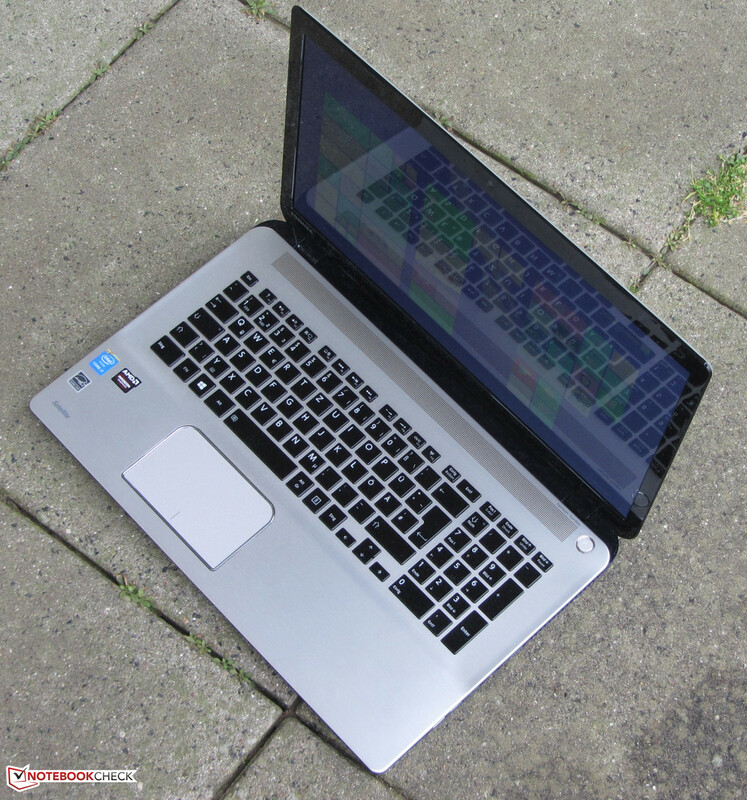 The HP Envy 17-k104ng (279.6 cd/m²) falls slightly behind the competitors. 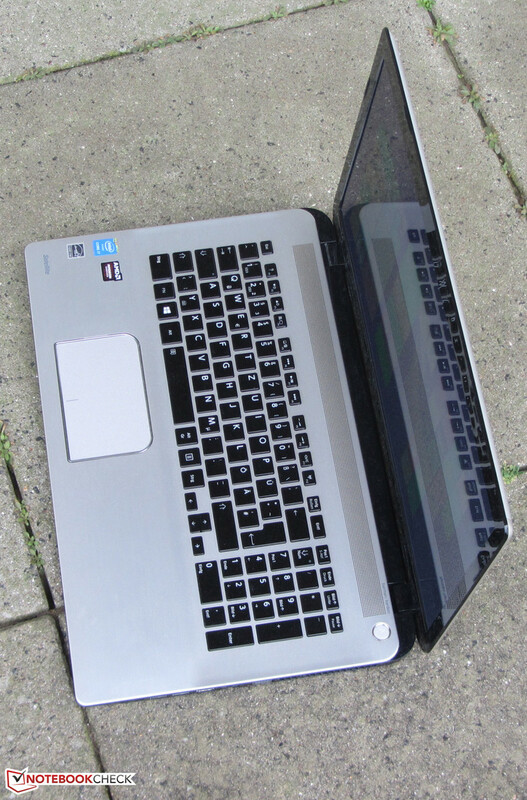 Contrast (671:1) and black value (0.48 cd/m²) are good, but we expect more from a 1200-Euro (~$1346) notebook. The Asus N751JK-T4144H (510:1; 0.68 cd/m²) and the HP Envy 17-k104ng (673:1; 0.45 cd/m²) do not perform better, either. The Satellite's display neither covers AdobeRGB nor sRGB. The coverage is about 60.4% (AdobeRGB) and 80.9% (sRGB), respectively. The colors cannot convince in factory state. The average DeltaE 2000 deviation is 10.42. A value below 3 would be desired. In addition, the display is bluish. Toshiba equipped the Satellite with a TN panel. Thus, the viewing angles are limited. 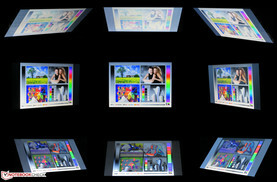 In horizontal direction, the display performs better than in vertical direction. Several people can look at the display simultaneously. The image quickly changes with the vertical angle. 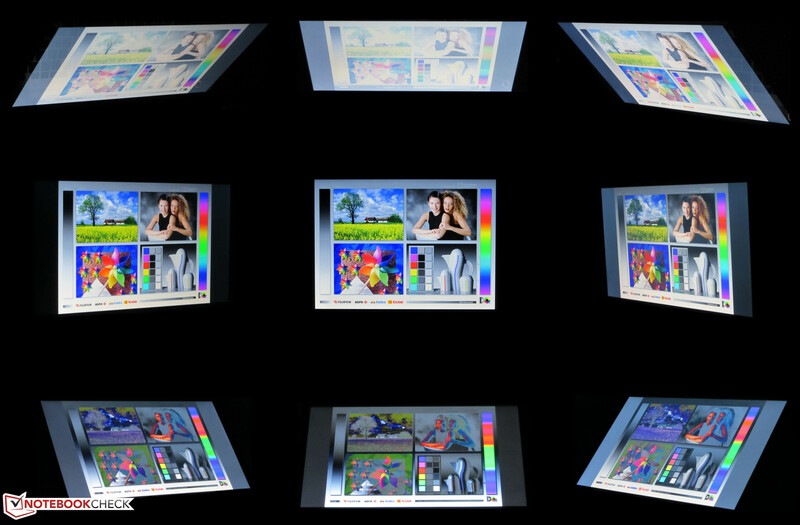 While the display's brightness is sufficient for outdoors, outdoor use is quickly impaired by the glossy surface. 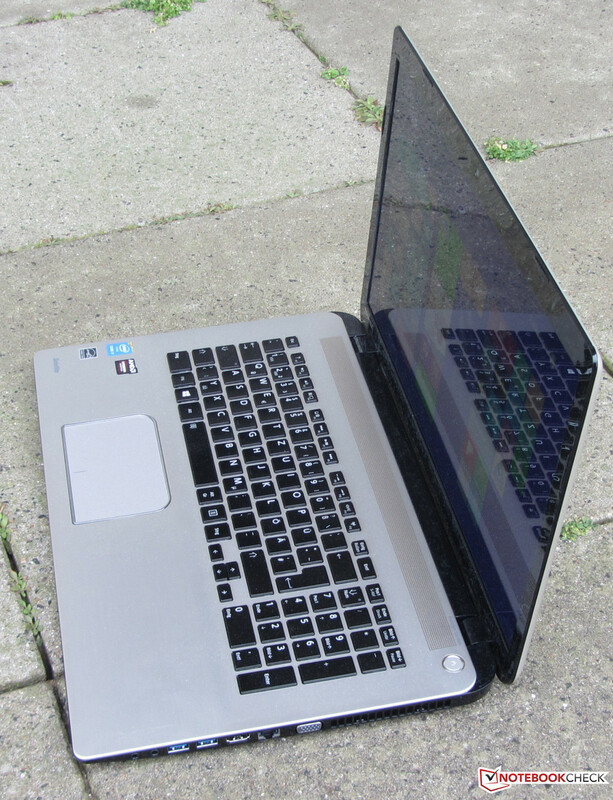 The Satellite P70-B-10T is a 17.3-inch all-round notebook. Thanks to a powerful Core i7 processor, the computational performance is sufficient for most application scenarios. The Radeon graphics core can run current games. Our test device is priced at about 1200 Euros (~$1346). If you can accept slightly worse hardware (Core i7-4710HQ, 12 GB RAM, 1 TB hard drive), you'll get the computer for about 960 Euros (~$1078). 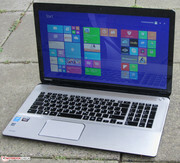 Toshiba equipped the Satellite with Intel's Core i7-4720HQ quad-core processor (Haswell) with a base clock of 2.6 GHz. Thanks to Turbo, the clock rate can increase to 3.4 GHz (all four cores), 3.5 GHz (two cores) and 3.6 GHz (only one core). The Turbo is not fully used. 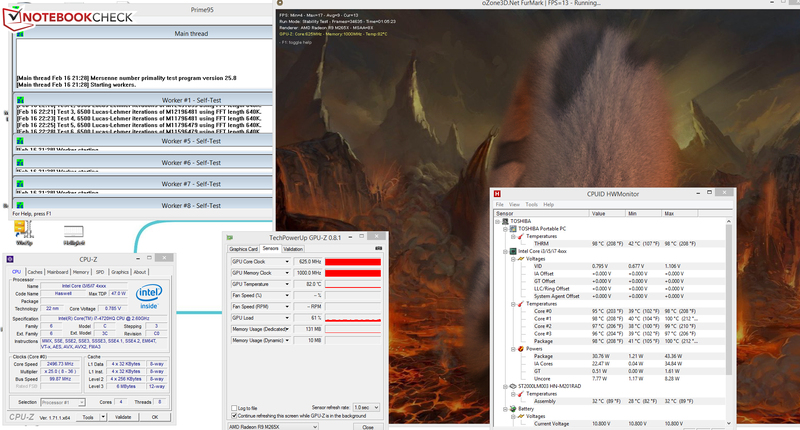 During the single-thread tests of the Cinebench benchmarks the CPU clocks at 2.9 to 3.6 GHz, while it constantly clocks at 2.9 GHz during the multi-thread tests. So, the processor performs worse than possible in multi-thread applications. 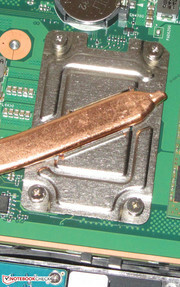 On battery, all CPU tests are processed with the base clock (2.6 GHz). The system works smoothly and we did not face any problems. The results of the PCMark benchmarks are also very good. 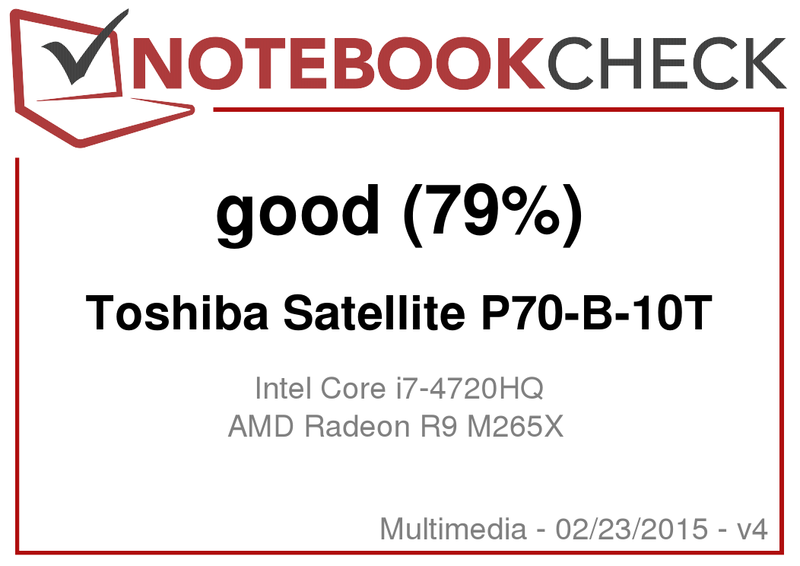 It is surprising that the Satellite performs significantly better than the Asus N751JK-T4144H in the PCMark 8 Home Benchmark, although both computers virtually use the same CPU. In addition, the Asus features a more powerful GPU and an SSD. We assume that the Home benchmark especially profits from the Radeon GPU. As expected, the Asus notebook performs better in the Work and Creative benchmarks. Thanks to its SSD, the Asus performs significantly better in the PCMark 7 benchmark. 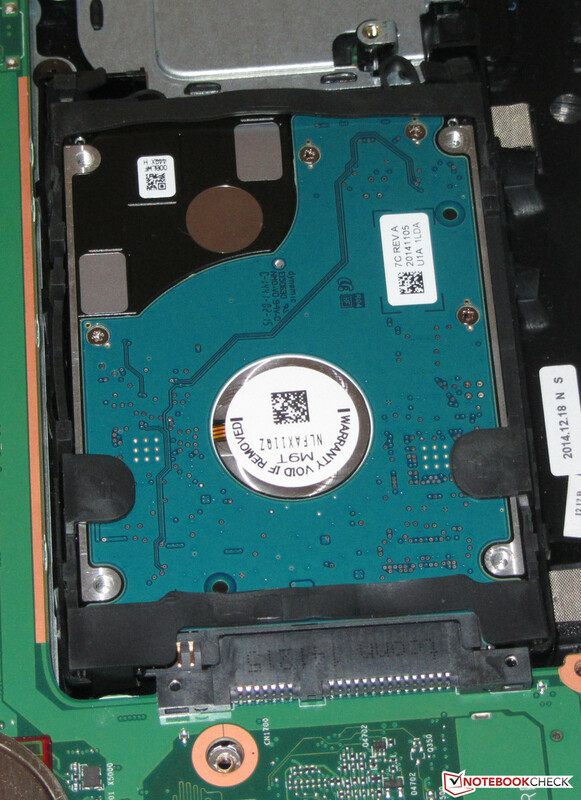 The Satellite features a hard drive from Seagate with a capacity of 2 TB and a revolution speed of 5400 rpm. CrystalDiskMark reports a read rate of 108.8 MB/s. HD Tune displays an average transfer rate of 88.58 MB/s. These are good results for a 5400 rpm hard drive. 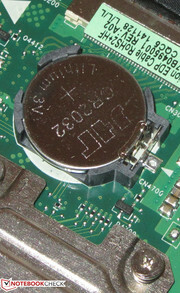 The Satellite uses a graphics switch (Enduro). Intel's HD Graphics 4600 GPU is used for everyday tasks and on battery. Demanding applications like computer games run on AMD's Radeon R9 M265X. Usually, the graphics cores are switched automatically. But, this does not work as smoothly as with Nividia's counterpart (Optimus technology). Sometimes, manual adjustments by the user are required. The Radeon GPU is an upper mid-range graphics card. It supports DirectX 11.2 and is driven by a clock rate of up to 625 MHz. Due to the 3DMark benchmarks, the graphics core ranks in above Nvidia's GeForce 840M GPU and significantly below the GeForce GTX 850M. Those spending more than 1200 Euros (~$1346) on a notebook expect that it can run games and the Satellite is indeed gaming capable. 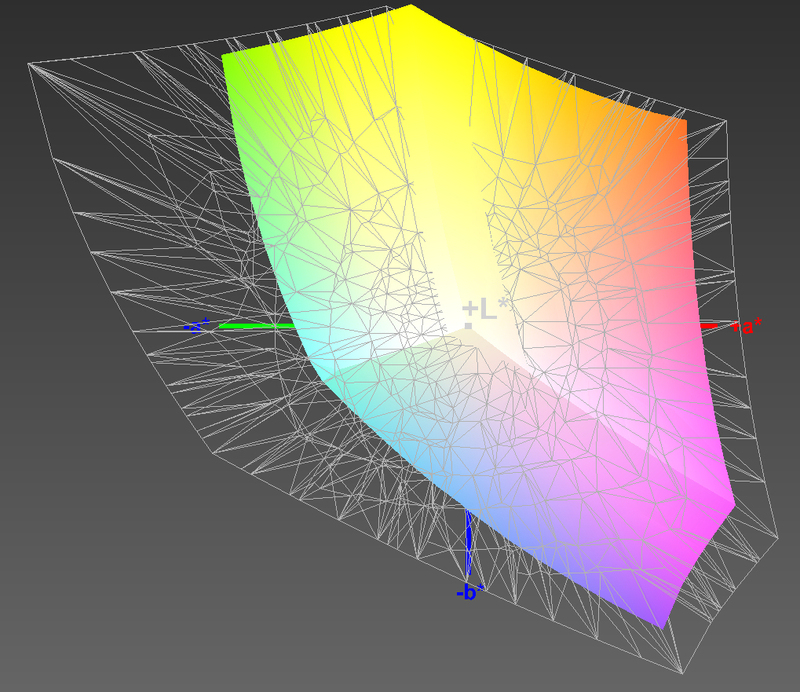 However, usually the resolution has to be limited to HD (1366x768 pixels) and the quality settings to medium to high. Only a few games can use the native resolution of the display. The Satellite quickly reaches its limits in performance-hungry games like Ryse: Son of Rome. You'll need a different notebook for significantly more gaming performance, which does not even need to be more expensive: For example, the Acer Aspire V 17 Nitro with GeForce GTX 860M GPU, matte IPS FullHD display and SSD is available for 1000 Euros (~$1123). It is not to be expected that the Satellite is silent. While idle, fan and hard drive rarely stand still at the same time. Most of the time, the fan works audibly. If you want a quieter notebook, you should consider competitors like the Asus N751JK-T4144H and the HP Envy 17-k104ng. During the stress test, the noise level of the Satellite increases to 47.6 dB. The Asus (42 dB) also works quieter under full load. It is surprising that the Envy 17-k104ng (52.3 dB) with a frugal ULV processor is loudest during the stress test. The Satellite during the stress test. The Aspire completed the stress test (Prime95 and Furmark running simultaneously for at least an hour) in different ways in AC power mode and battery mode. In AC power mode, the processor ran at 2.3 to 2.6 GHz and the graphics core worked at full speed (625 MHz). On battery, it is reduced to 400 MHz. The notebook only gets moderately warmer. Only the part with the cooling system gets very hot (above 50 °C). The Asus N751JK-T4144H and the HP Envy 17-k104ng remained cooler than the Satellite during the stress test. The reason is throttling in the Asus computer. The Envy profits from its ULV processor and the very high fan speed. (±) The average temperature for the upper side under maximal load is 33.1 °C / 92 F, compared to the average of 30.9 °C / 88 F for the devices in the class Multimedia. (+) In idle usage, the average temperature for the upper side is 23.5 °C / 74 F, compared to the device average of 30.9 °C / 88 F.
The Satellite's speakers sit above the keyboard behind a perforated cover. The imprint "Harman/Kardon" promises a high-end sound. The promise is not broken: The speakers produce a pleasant, full sound and you can listen to them for a long time. If you activate the preinstalled DTS software, the sound can even be improved. While idle, the Satellite performs slightly better than the Asus N751JK-T4144H and the HP Envy 17-k104ng. However, things change under load. 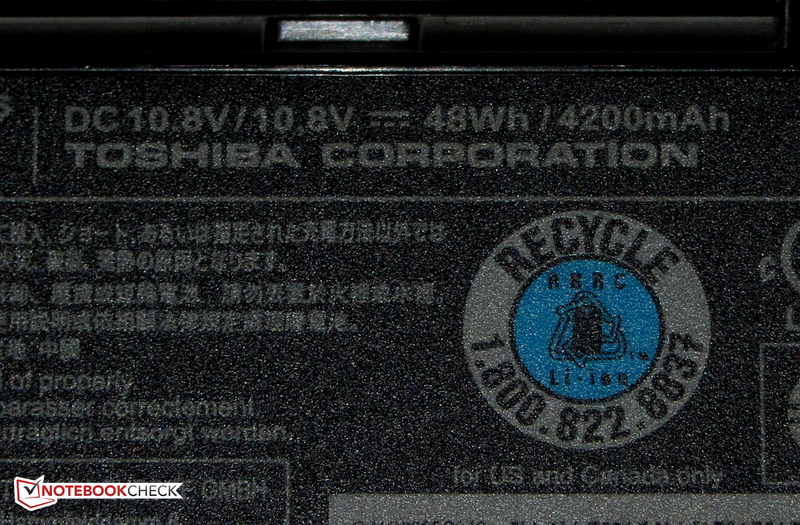 The Toshiba requires significantly more energy than its competitors. The reasons are easily found: Contrary to the Satellite, the HP uses a frugal ULV processor. The Asus suffers from GPU throttling. The battery of the Satellite lasts 7:19 h while idle. 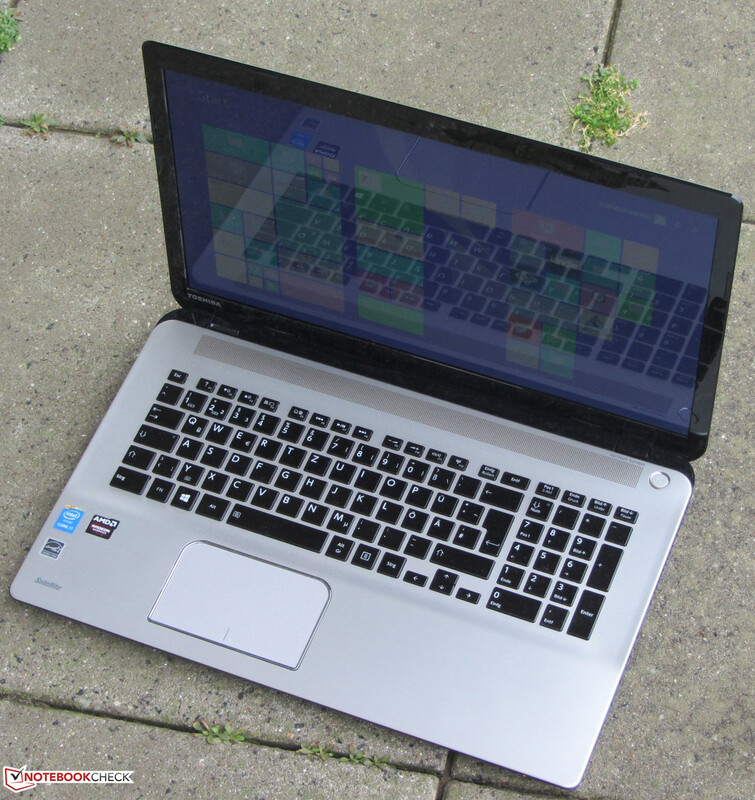 The Asus N751JK-T4144H (5:56 h) and the HP Envy 17-k104ng (5:29 h) perform worse. Idle mode is simulated by the Battery Eater Reader's test with minimum display brightness, enabled energy-saving profile and disabled radio modules. Under load, the Satellite shuts down after 0:47 h. It ranks in-between the Asus (0:42 h) and the Envy (1:16 h). The load runtime is recorded by the Battery Eater Classic test with maximum display brightness, maximum performance profile and active radio modules. The Toshiba completes the WLAN test in 3:43 h. It ranks in-between the Asus N751JK-T4144H (4:58 h) and the HP Envy 17-k104ng (2:56 h). This test automatically opens websites in 40-second intervals. The energy-saving profile is active and the display brightness is set to roughly 150 cd/m². We tested the battery life during video playback by running the short film Big Buck Bunny (H.264 coding, 1920x1080 pixels) in a loop. The radio modules are deactivated and the display brightness is set to about 150 cd/m². The Satellite lasts 3:03 h. We did not run this test on the two competitors. If you are not satisfied with the battery life of the Satellite, you can improve it by replacing the battery. 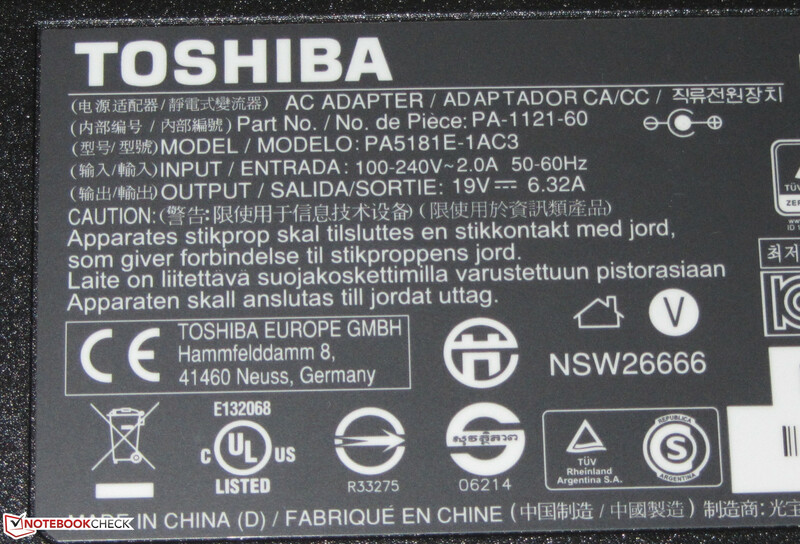 Apart from the standard battery (48 Wh), Toshiba also offers a model with a bigger capacity (67 Wh; PA5110U-1BRS) for about 140 Euros (~$157). 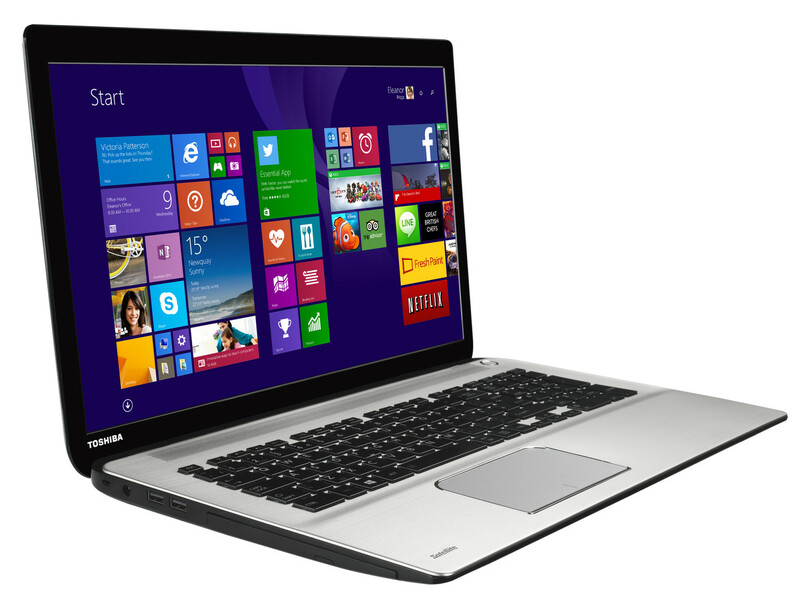 The Toshiba Satellite P70-B-10T belongs to the all-round notebooks with a size of 17.3-inches. The price of just under 1200 Euros (~$1346) raises high expectations, which the device, unfortunately, cannot meet in all aspects. The powerful Core i7 processor delivers sufficient performance for all application scenarios. The Radeon core allows playing current games. Thanks to the 2 TB hard drive, owners won't run out of space too quickly. 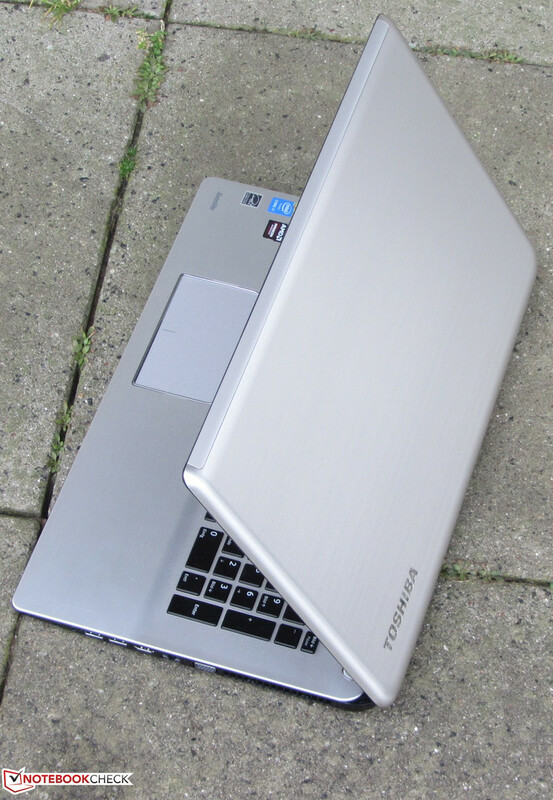 The battery life is usual for a 17.3-inch all-rounder. In addition, the input devices are good. The case is a little disappointing since we expected a more high-end case with better build quality for 1200 Euros (~$1346). With the N751JK-T4144H, Asus shows how it should be done. The display has to be criticized, too. 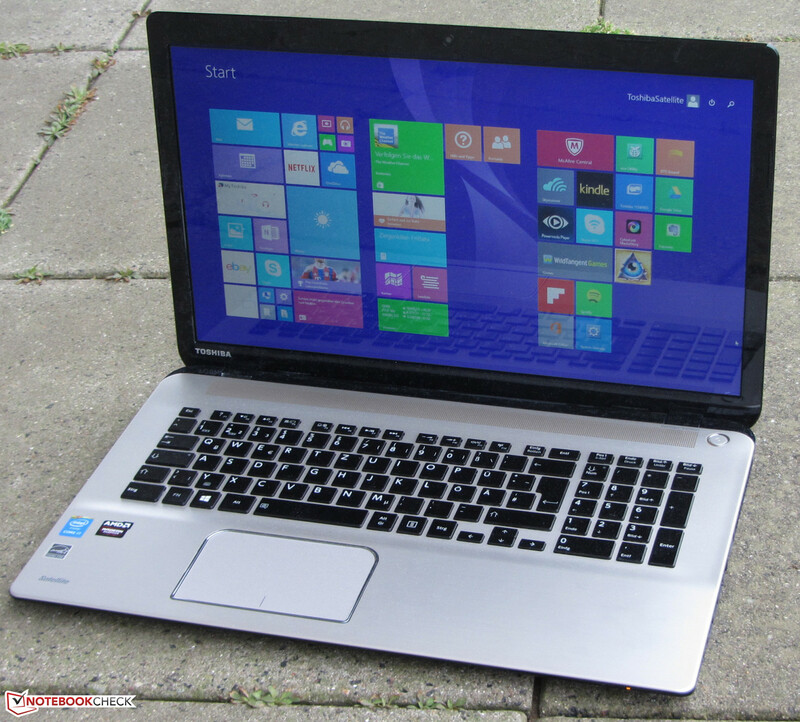 Toshiba uses a TN model, but an IPS panel with wide viewing angles should have been obligatory in view of the price. To be fair, we have to mention that the Asus N751JK-T4144H and the HP Envy 17-k104ng also come with TN panels. Probably IPS panels with a size of 17.3-inches are hard to get. 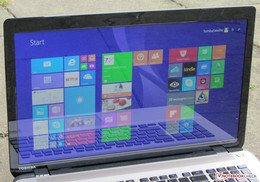 However, Toshiba should have at least used a matte surface. 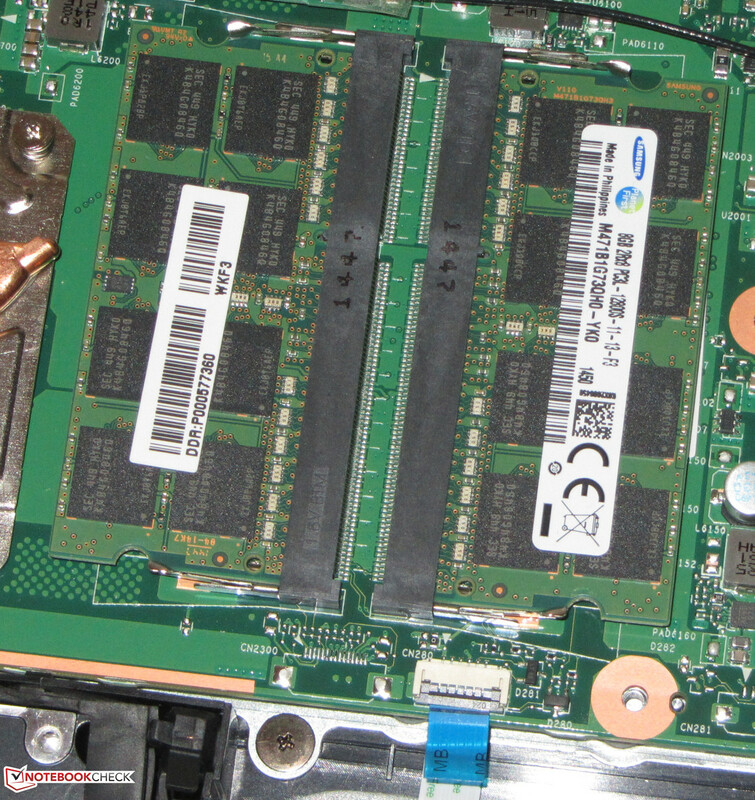 We also expected an SSD as system drive in addition to the conventional hard drive. Such a combination can already be found in cheaper notebooks. The Asus N751JK-T4144H impresses with a higher quality case and better battery runtimes in the realistic battery tests. In addition, it delivers higher frame rates in games thanks to a more powerful graphics core. The latter is also true for the HP Envy 17-k104ng. Input devices of the Satellite P70-B. Despite a price of just under 1200 Euros (~$1346), the computer only houses a DVD burner while we would have expected a Blu-ray drive. Toshiba uses speakers from Harman/Kardon. ...and graphics core are soldered. The WLAN module supports the 802.11 ac standard. The BIOS battery could be replaced. 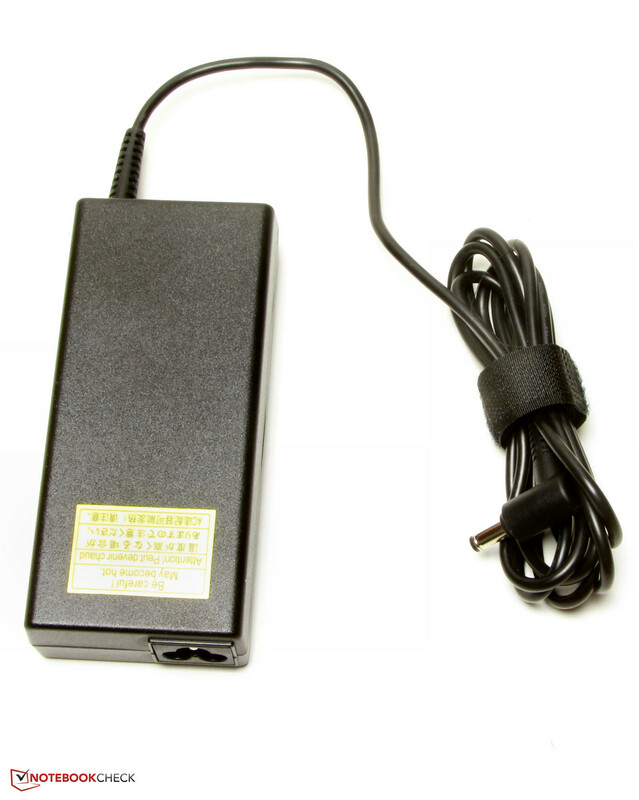 The power adapter weighs 544 grams. Its nominal power is 120 Watt. The speakers produce a nice sound. An IPS panel with matte surface. 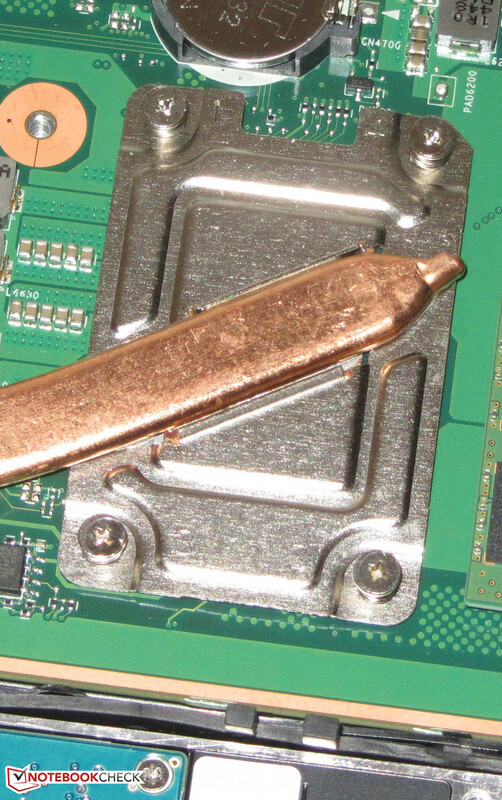 A Solid State Drive. Asus N751JK-T4144H, Wortmann Terra Mobile 1774P, HP Envy 17-k104ng, Acer Aspire E5-771G-71PT, Asus F751LDV-TY178H, Lenovo Y70, Acer Aspire V 17 Nitro.